Guida update: Guida is doing ok today, similar to yesterday but less crampy. Definitely not back to ‘normal’ quite yet. One of the advantages Guida has in dealing with this is that she is in really good health, strong and agile. With colic elephants often lie down to help gas pockets pass, they do a lot of different posturing as well. Guida gets up faster as a sick elephant than almost any healthy elephant we have seen. It is easier on her body because she is strong and it doesn’t require significant effort for her to repeatedly lie down and rise. This photo is from this morning. You can see on her face that she’s bright but tired. Maia was actually very tired as well. We had to close Maia out of the barn for a bit so Guida had a better chance at eating. Although Maia is a very supportive sister, sharing food is not a strong characteristic of hers. There are a few concerns people had yesterday, one is that she is lying down all of the time, which she is not. She does lie down to help pass gas, and sometimes to rest, but most of the time she is standing and walking around. 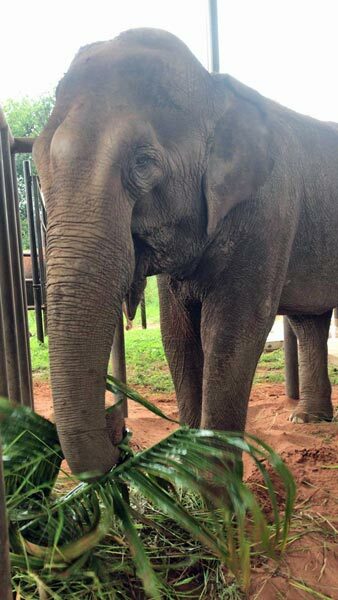 Outside of closing Maia in or out so Guida can eat, the barn has remained opened to the first and second yards. Both of them can come and go as they please. Rana also comes to visit. She spent all last night out by the pond, stayed there during the downpour this morning, but is spending the afternoon with Maia and Guida under one of their favorite trees. For those familiar with colic in horses, it’s slightly different in elephants in regards to management and presentation. Most elephants will lie down, but not roll in the dramatic fashion that horses do. Guida has remained calm the entire time, sometimes seeming frustrated at the oncoming cramps, but not stressed. We are hoping tomorrow continues to bring improvements since she’s not out of the woods just yet. Thank you for all of the continued healing thoughts and love being sent her way. Sorry for not having the time to respond to comments or answer questions. Sounds like me when I have heartburn! It passes. That’s great news thatGuida has improved slightly. Fingers crossed she will improve each day. Bless Maia for being very supportive to her sister although still drawing a line at sharing food!! Rana loves the pond. Wonderful she is still spending time with the girls. Gradually becoming a family. Still sending healing and positive thoughts to Guida. Thank you for the update. My good thoughts continue for Guida,, and Maia and Rana also. I hope Guida continues to improve. Lots of love to you sweet girl!